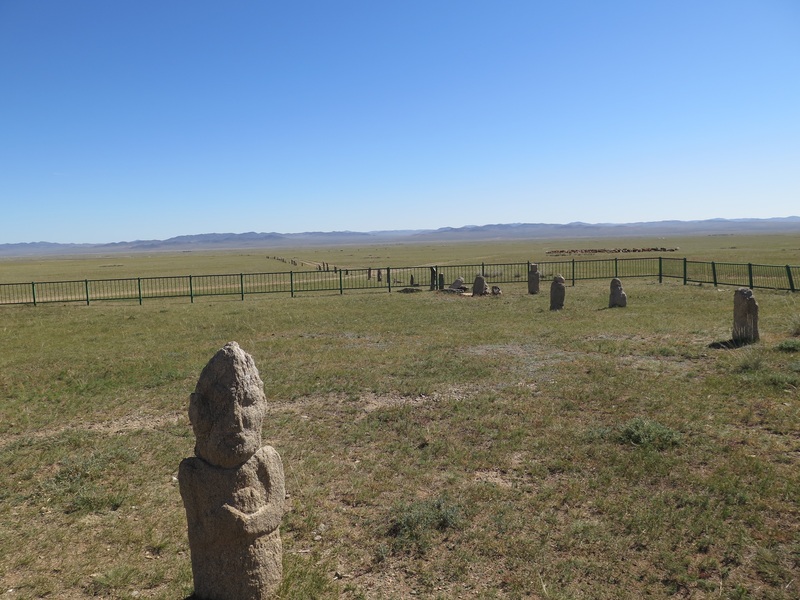 We decided fairly early in our trip planning process that we wanted to take a tour of Mongolia in order to see a few things outside of Ulaanbaatar. After checking out the websites of a few different touring companies and reading various reviews on sites like tripadviser, we settled on Meg’s Adventure Tours. Once we started corresponding with her, we were very glad of our choice. Meg speaks English fluently, and is very responsive. (Our one delay in a response was the result of her trekking in New Zealand.) We told Meg how long we had, and she suggested an itinerary for us. We said yes please. 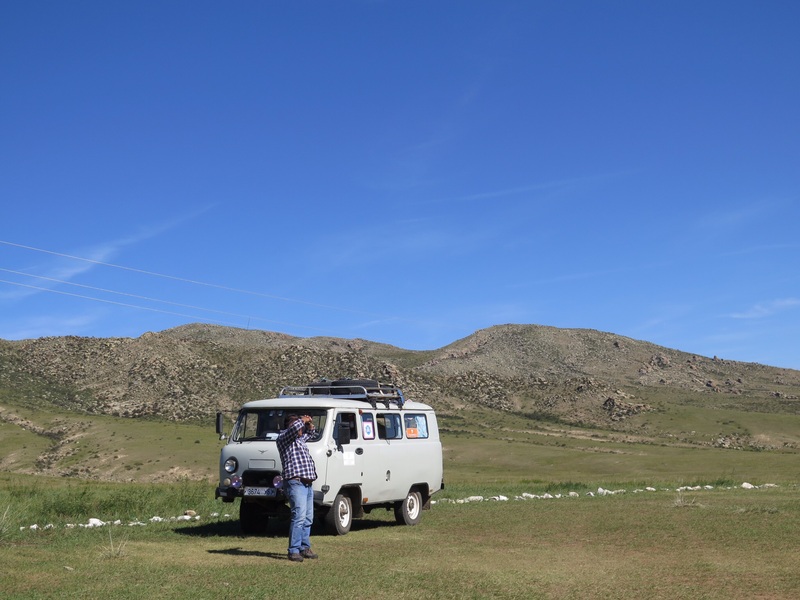 Meg met us at our hotel at 8:00, and we were quickly settled in her driver Ogi’s “Soviet”-built van. The van (really a truck) looks and feels ancient, although Meg assured us it is less than 10 years old. “These are the very best for off-roading,” Meg said. This should have been a warning. Ogi and his truck, searching for horses. 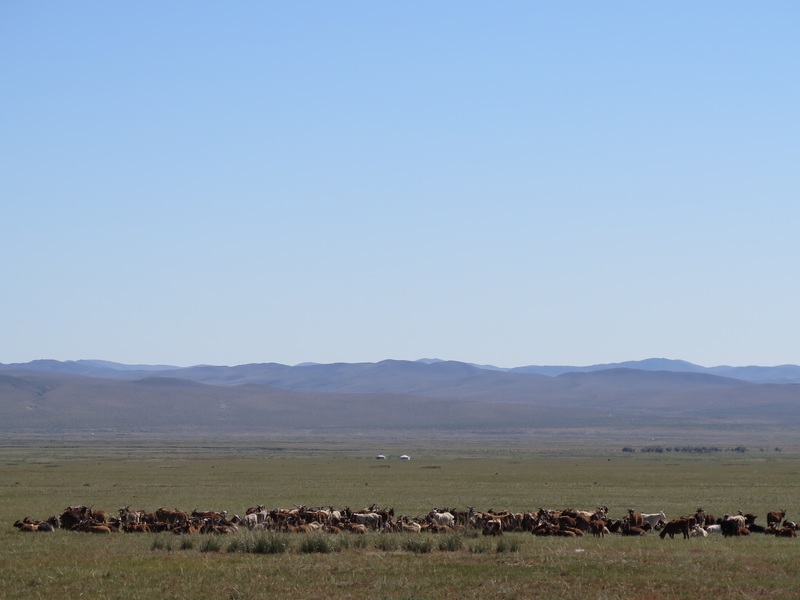 Our first stop was Hustai Nuruu National Park, where dwell the famous Takhi-Przewalski horses. Internationally, they’re knows as Przewalski horses, after the Polish scientist that “discovered” them. But the locals call them Takhi, and that’s the name I prefer. Takhi are the only living wild horses from which modern domestic horses are descended. All other “wild” horses are actually the result of domestic horses that were released into the wild. As of 1968, Takhi were extinct in the wild in Mongolia, and soon the species was represented only by animals bred in captivity and living in zoos. In 1980, a plan to reintroduce Takhi to the wild was conceived, and in 1992 the first Takhi were transported and released in Hustai. As of 2014, there were some 300 wild Takhi in the park. 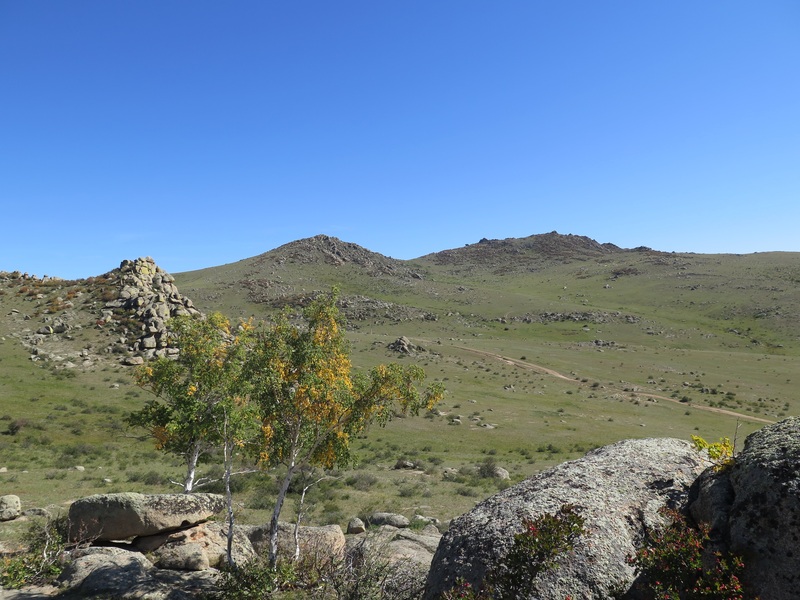 These Takhi are the main attraction of Hustai, although the park is also stuffed full of other animals and incredible landscapes. 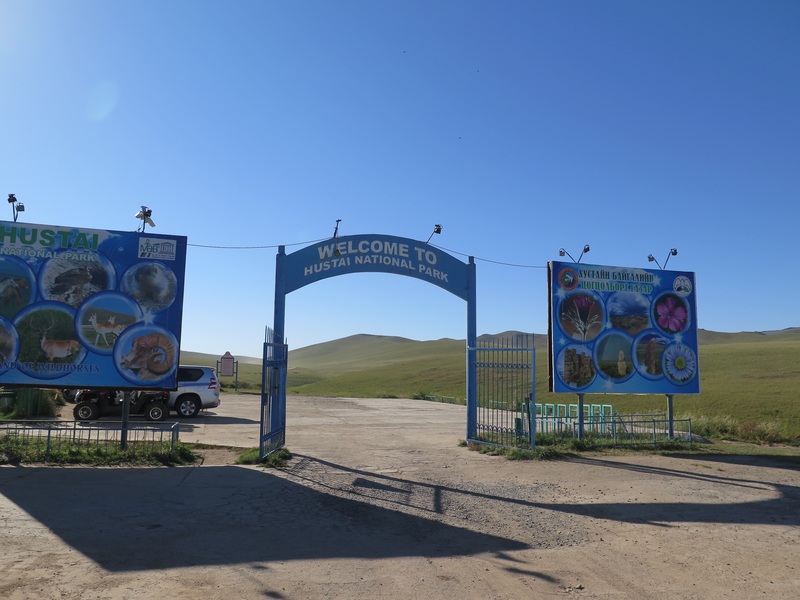 To get to the park, we drove out of Ulaanbaatar on a paved road, then once in the country turned onto a dirt road for a good long while until we reached the entrance to Hustai park. Entering the park. There’s a toursit complex here, with gers where you can rent a fancy night’s stay. We watched a video about the park, and browsed a gift shop before heading of in search of wild horses. That’s when the road really got interesting. We left the park visitors’ center in search of Takhi, driving up and down hills and keeping eyes peeled for elusive brown movements. For a while we saw nothing, but finally Ogi spotted some off to the right. We got out of the truck and walked slowly up the hill towards the horses. Find the horses in this photo (taken at maximum zoom)…. As we got close enough to see, we could tell there were just three. They were playing, kicking and bucking for a bit, then taking a rest break for some good grazing before going back to their play. Meg said they were most likely a bachelor herd, male horses too old to remain with the dams and too young to challenge for their own herd. Here’s a close-up of two of them. They’ve noticed us, but are not terribly bothered. They were beautiful, but it was more the place than the Takhi that moved me. The spicy smell of the grasses drifted up as we walked along, and the sun glinted on rocks and leaves starting to change autumn yellow. Birds sang, grasshoppers hopped, and in the distance we could hear the horses playing. Just one of many beautiful landscapes. This is the view back down to the truck from where we observed the takhi. After we found the horses, we were on a mission to the next park’s attraction, an Ongot funeral site. This was built in the 6th to 8th century, during the Turkish period. (I don’t know what that means, exactly. But this is what Meg is telling me. She is frying vegetables for soup as I type.) When important men died during this time, rock monuments were carved for them. The monuments are about three feet tall, and have been worn over the ages until their features are hard to determine. But their hands are folded over their chests with their fingers spread. Symbolizing something, I’m sure, but I’m not sure what. 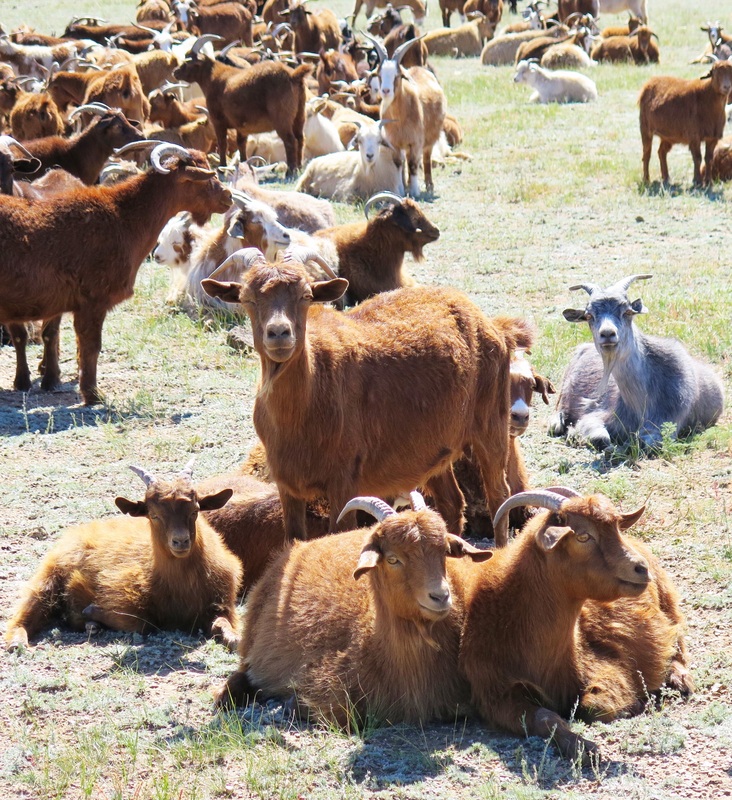 We thought this herd of goats was super cool. Really it was just the first of such herds we’d seen; they’re everywhere. The only unusual thing about this one was that it was all goats, not a mix of goats and sheep. Walking back from our excursion to take photos of goats. Meg has set up a table and is making a picnic lunch. Lunch over, we trooped back into the car for more scenic views (a falcon! a marmot! horses! cows! goats and sheep!) and more bumps. And if I thought the road was interesting before, let me tell you: it got better. Meg’s 5-year-old daughter who is with us thought I was the funniest thing ever, the way I bounced around the back seat. 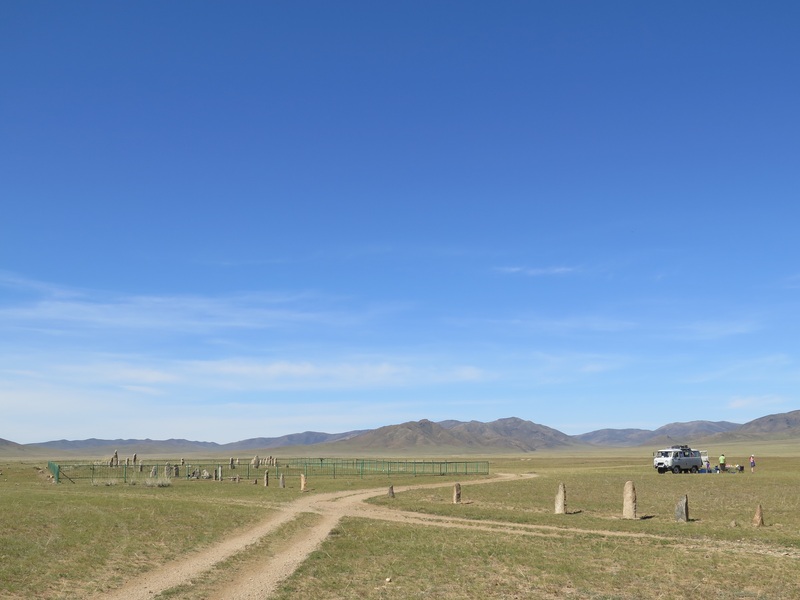 The day ended when we pulled into Khögnö Tarnyn Khiid monastery, where we would be spending the night in a ger home of the woman who maintains the monastery. Although we did very little walking today, when I checked my fitness band before bed I was at 30,000 steps, which equated to 14.5 miles. In bounces. Edited to add: Steve’s description of our first tour day is at Nomadic Days.